Why You Need To Get Out Of Your Comfort Zone To Reach Success - Motivate Amaze Be GREAT: The Motivation and Inspiration for Self-Improvement you need! 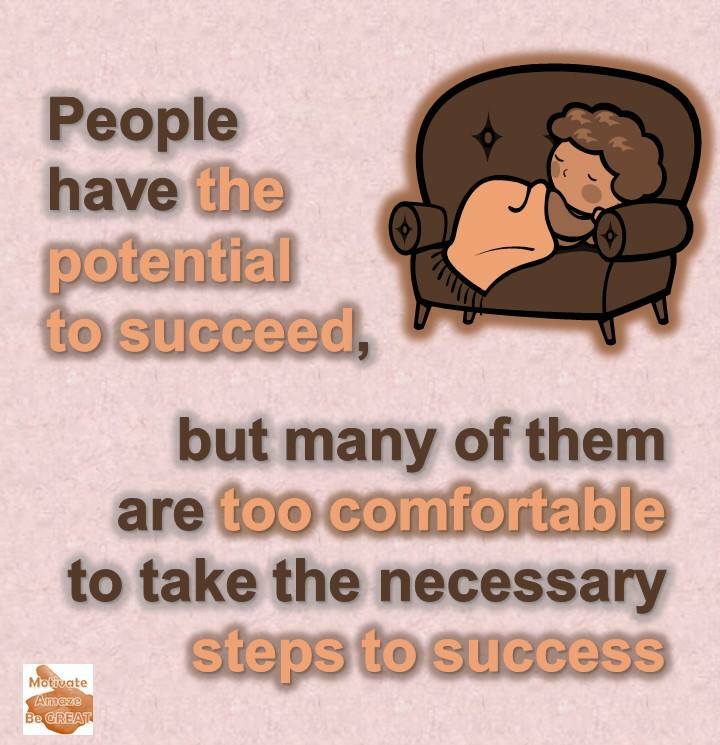 "People have the potential to succeed, but many of them are too comfortable to take the necessary steps to success." We all need it, we all love it, we all look for it! It gives us a feeling, it's also a feeling, it's being in that physical and, or, mental place of ease and well being. Everyone needs it sometimes, everyone looks for it sometimes, but some people, look for comfort all the time! But those same people wish they're successful despite doing nothing about it. That's when comfort really becomes a handicap to reach success. You need to get out of your comfort zone! You like to eat, eating brings you good feelings, but now you're addicted to food, you just can't stop eating that delicious pizza. You can't say no to fast food when friends invite you to eat out. Consequently, your becoming over-weighted. You feel excellent about eating it gives you that comfort, any time you can get whatever to eat and get great feelings, so you do it non stop! But, what you see in the mirror is becoming more uncomfortable each time you look. 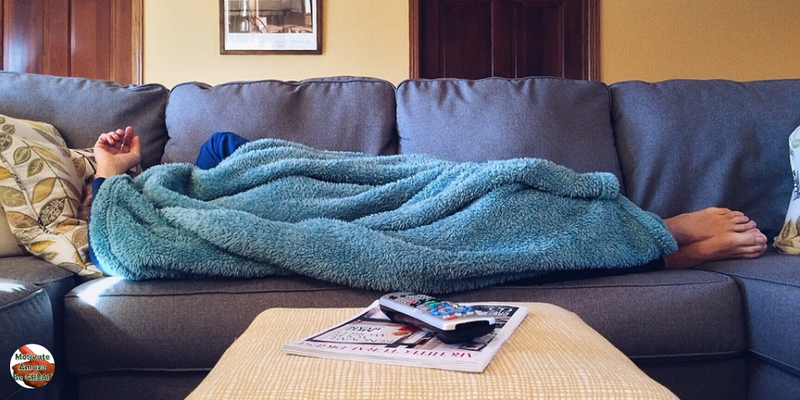 You love movies, you're a "Hollywood encyclopedia", you know everything about movies, but you're becoming a couch potato. Every night you just want to see movies non stop. Consequently you go to bed late each night, you lose notion of time often, the time you should use to do other stuff. You feel excellent about movies, you are on a row! Movie after movie, but you start to feel bad about the hours you lose with that addiction. You love gossip, you love talking about people, your friends really like your jokes and your habit of gossiping all the time about everybody. You feel validated by it. But people you talk about simply can't stand you, You feel excellent when you talk about other people, you do it all the time without control, but now you're feeling bad because many of those people don't like you. Whatever you're doing that gets your comfortable, you start to exaggerate, and it becomes way to much! You are not living other things because you're stuck on living the same old thing, but you cannot stop because it brings you great feelings. All this can be a symptom that you're getting excessive comfort. You really should do something about it to get out of this comfort zone. 2. Comfort Is Good But Discomfort Is Better! Get it straight: nothing wrong with having some comfort, the problem is having excessive comfort. Did you do things any new thing? Did you do things that you are not used to do? Did you do things that contribute to others things besides comfort? Like personal growth - making you better? Like contribution - making others better? Simply different things you aren't used to do? In the majority of cases, whenever you do something in life that makes you uncomfortable you need to adapt. In other words, you have to manage that particular situation you're not used to do, with a different set of skills you don't use often or you don't have. Conclusion: you have to learn something new! So, if you're feeling uncomfortable, think again, enjoy the new experience and start to call it learning. By doing something new or recycling your capacity revisiting skills that were a little rusty, you are growing and becoming better. This is where the famous "get out of the comfort zone" quote comes into play in your journey to success. Yup! It's cliche we know, but it's right on point! You really must get out of your comfort zone if you want to be successful. If you do the same old things you are used to do, you will get the same results you always got. You want different results? Do different things and learn from them. We see people with all the potential to succeed everyday, but many of them are too much comfortable to take the necessary steps in the ladder of success. People who have all the necessary resources and knowledge but won't pass the obstacles in their way, not because they lack capacity, but because they are too much comfortable with the things they have or do, so they get lazy with it. Maybe it's comfort that is stopping them to achieve their dreams, you can be in this position also so get out of i! People who hate their job, but have a good financial situation, their salary it's enough to buy and pay things they need do live. They are comfortable with it, that comfort is stopping them from quitting that job and finding a new one that they would love, and would get them to be fulfilled. People who love eating and have fitness goals. They love eating the same caloric foods all the the time, they love it so much that the countless hours they spend on the gym have zero results. In fact, they are getting heavier, comfort is their handicap in the path to reach their fitness goals. They need to get uncomfortable by eating healthy food. People who want to be better at any activity, but the time they spend gossiping and talking on the phone it's take them away the amount of hours needed to be used in personal development activities. Comfort it's their handicap in the path to reach their personal development goals. They need to shout down from the world, get uncomfortable by not gossiping a few hours a day, and dedicate themselves to learning. We hope now you understand why you really need to get out of your comfort zone to achieve success! Share this article with your social connections so they too can step out of their comfort zone and be successful.